14k gold custom made solitaire ring consisting of european cut shape, natural diamond, weighing 2.28 - 2.38 carats, having a L color and VS1 clarity, according to GIA grading scale. The center stone measuring 8.50mm x 8.61mm x 5.02mm. Inclusion Description: The grade making inclusions are: a very small crystal located outside the crown, and a very small bruise in the pavilion that reflects into one other facet. Blemishes Description: Very minor abrasions on several pavilion facet junctions. Retro Diamond ring circa 1945. Center diamond is an old European cut diamond and is more than likely from the 1930's. 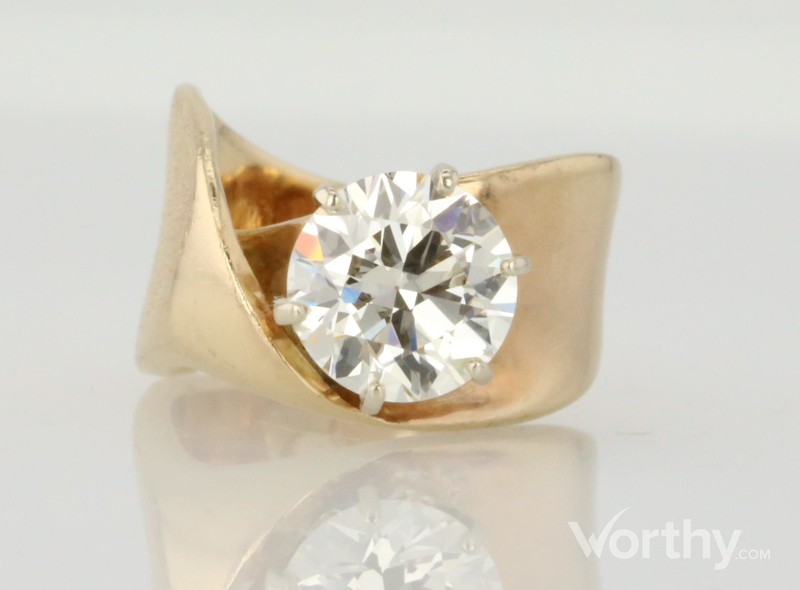 Condition: Very good- newer head (not recent), and texture has worn smooth from one area of ring near the diamond. Diamond was most likely added to the ring at a later date due to points of wear. Ring size is approximate due to sizing beads. Girdle is thin to slightly thin. Diamond faces up I-J color.